FASTNET ROCK (AUS) (Bay 2001-Stud 2005). 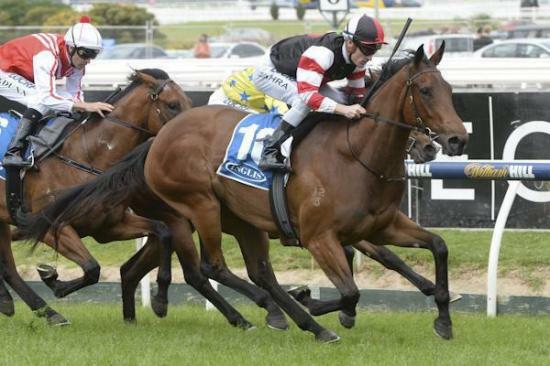 6 wins to 1200m, VRC Lightning S., Gr.1. Champion Aust. Sire twice. Sire of 1053 rnrs, 704 wnrs, 89 SW, inc. Super Cool (VRC Australian Cup, Gr.1), Atlantic Jewel, Sea Siren, Planet Rock, Mosheen, Fascinating Rock, Driefontein, Amicus, First Seal, Atlante, Foxwedge, Lone Rock, Diamondsandrubies, Qualify, Magicool, Nechita, Rock 'n' Pop, Irish Lights, Wanted, Albany Reunion, Your Song, Rock Classic, etc. MISSROCK (f. by Fastnet Rock). Winner. See below. Cartier Rock (f. by Fastnet Rock). Winner at 2 in 2014-15, ATC Schweppes 2YO H., 2d ATC Sydney Markets H., 4th ATC Schweppervescence H., Gr.3. Power Supply (g. by Exceed and Excel). 4 wins at 1200m, A$107,010, to 2014-15, 2d BRC Novotel Brisbane Airport P., 3d ATC Bloodstock.com.au H.
City of Justice (c. by Redoute's Choice). 3 wins from 1300m to 2000m to 2015-16 in Aust. MRS ONASSIS (General Nediym). 8 wins at 1000m, 1100m, A$516,680, MRC Oakleigh P., Gr.1, ATC Starlight H., L, MRC Alinghi S., L, ATC Vinery Stud H., Bella Riva H., Schweppes H., 2d NSW Tatt's RC Concorde S., Gr.3, 3d MRC Sportingbet Sprint S., Gr.3. MISS JUDGEMENT (Strategic). 10 wins. See above. FIFTH AVENUE LADY (Encosta de Lago). 6 wins from 1400m to 1600m, A$295,000, VRC Matron S., Gr.3, MRC Redoute's Choice Cup H., Greater Dandenong Chamber of Commerce H., Black Shoes H., 3d MVRC Sunline S., Gr.2, MRC Mal Seccull H., Aquanita H.
AUSSIES LOVE SPORT (Redoute's Choice). 4 wins at 1200m, 1400m, A$332,395, to 2014-15, ATC Ming Dynasty H., Gr.3, SCTC Campaign Group H., ATC Dooleys H., Ranvet H., 2d ATC Razor Sharp H., L, Membership on Sale Now 2YO P., Egroup Security H., 3d ATC Stan Fox S., Gr.2, Become an ATC Sponsor 2YO H.
Fusakeo. 6 wins from 1200m to 1800m, A$227,540, AJC Randwick Betting Auditorium H., Bradshaw H., Waterloo H., $100,000 Big 6 Jackpot H., 2d AJC Corporate Membership H., Sydney City Toyota H., STC National MEA Banqueting & Catering Award Winners H., Grand Pavilion H., 3d GCTC Magic Millions Stayers Cup, STC Whites Wires H.
RED ARROW (Red Ransom). 4 wins to 1300m, Hollywood Los Angeles H., Gr.3, Santa Anita Allowance, 2d MRC Sir John Monash S., L, AJC La Caissiere H., 3d MRC Bletchingly S., Gr.3, STC Leyland Private Asset Management H., 4th Golden Gate Fields Sprint S., L. Sire. ABLE CHOICE (Dehere). Champion Griffin in Hong Kong in 2001-02. 7 wins-3 at 2-to 1400m, A$30,000, HK$5,859,500, HKJC Juvenile Sprint Trophy, HK-3, Co-Tack H., Sheung Wan H., Exploring Southwest China Plate, Staunton P., Pok Oi Cup H., Tung Wah H., 2d MVRC Mitchell McKenzie S., L, HKJC Kowloon Cricket Club Centenary Cup H., 3d HKJC Kwai Hing H., Lark H., Yan Oi Tong Cup H., 4th VRC Ascot Vale S., Gr.2. Momentum (Kenmare). 3 wins at 1400m, 1600m, HK$7,847,315, HKJC Morse H., Plover Cove H., Austin H., 2d Hong Kong Derby, HK-1, HKJC Changchun H., Pok Oi Cup, Guilin H., Panasonic Digital World H., Wong Cup, Wellington H., Special Cargo H., Shanghai H., 3d HKJC January Cup, Harbour View H., Jardine H., 4th Hong Kong Gold Cup, HK-1, HKJC Sha Tin Vase, HK-2. Bullish Friend (Court Command). 7 wins-1 at 2-at 1200m, HK$8,234,250, HKJC Pacific Ocean H., Fung Mo H., Breguet P., Field Green H., Citibank Citibusiness H., Pak Sha O H., St George's Challenge Cup, 2d HKJC Acclaim H., Sunflower H., Good Luck H., Chek Lap Kok H., 3d HKJC Sprint Cup, HK-2, Craigengower Challenge Cup, Lord Kanaloa H., Super Win Griffin P.
Race Record: 3 Starts 1-0-1 A$86,000. Winner at 2, A$86,000, in 2015-16, MRC Debutant S., L, 3d VRC Emirates Airline P., Gr.3.